Radicular cysts develop as a sequel of untreated caries with pulp necrosis and periapical infection. The most common inflammatory odontogenic cyst develops over time found at apices of infected or necrotic pulps, occurring between the third and sixth decades of life with male predominance. Clinically, lesion is small, asymptomatic, and the affected tooth is nonvital, until detected by routine radiographic examination. With advancement in imaging technology, cone-beam computed tomography (CBCT) helps the endodontist view the tooth in the third dimension. 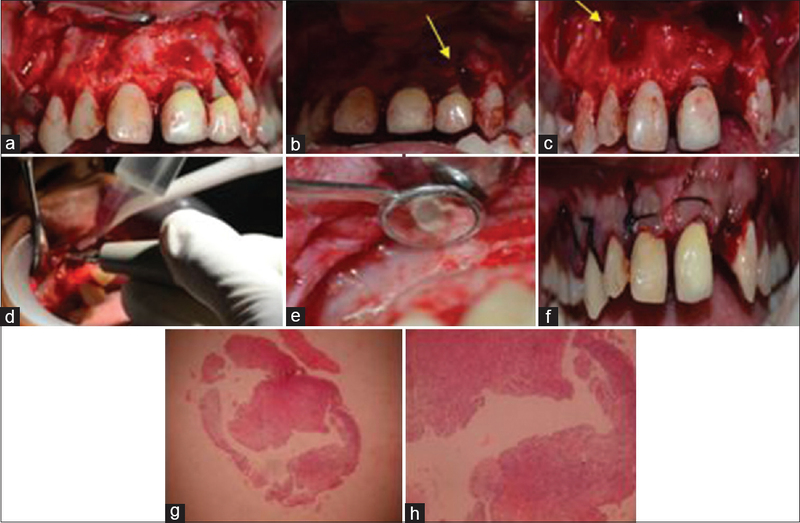 The present case report discusses the surgical management of bilateral radicular cyst in relation to the maxillary lateral incisors. A 22-year-old female patient reported to the department of conservative dentistry and endodontics with a chief complaint of food lodgment and discoloration in the upper left front region of the jaw for 2–3 months. On clinical examination, permanent maxillary left canine (23) showed blackish discoloration mesially with cavitation. On vitality testing, all permanent maxillary anterior teeth except maxillary left central (21) and lateral incisor (22) gave normal results and clinically both these teeth had porcelain fused to metal ceramic crown. On radiographic examination, 23 showed radiolucency involving enamel and dentin without any periapical changes [Figure 1]a. On palpation, a soft fluctuant nontender swelling in the left labial sulcus with a pocket depth of 7 mm distally, and Grade 1 mobility was noted with 22. Radiographically [Figure 1]a, 22 showed a faulty post core with external root resorption in middle third and bone loss distally with a periapical radiolucency, having a well-defined radiopaque border. 21 showed satisfactory obturation with normal periodontium. In view of the above findings, 22 was planned for extraction due to poor periodontal prognosis followed by cyst enucleation and was given the option of an implant by the periodontist. A CBCT was advised. The patient reported 5 months later with an orthopantogram [Figure 1]d which revealed lesions with 12 and 22 and a CBCT [Figure 1]b which confirmed the cystic lesion with 22 and a perforation of the labial cortical plate in relation to 22, measuring 10.6 mm × 6.6 mm. It was also observed that there was a cystic lesion with 12 measuring 6.8 mm × 5.4 mm. On clinical examination of the permanent maxillary right anterior region, it was observed that the central incisor (11) and lateral incisor (12) had tooth-colored restorations which were done 3–4 years ago. Permanent maxillary right canine (13) was sound. Vitality tests were carried out again after 5 months for the maxillary right anterior teeth, after the patient's first visit, 11,13 gave delayed response and 12 did not respond. Radiographically, 11 and 12 [Figure 1]c revealed faulty radiopaque filling approaching pulp and a well-defined periapical radiolucency, measuring 6 mm × 4 mm and involving the apex of 12. On the basis of history and clinical finding, a diagnosis of radicular cyst was arrived at. Medical history was noncontributory. Restoration of 23 with resin-modified glass-ionomer cement was completed. The treatment plan was explained to the patient: root canal treatment (RCT), cyst enucleation, apicoectomy followed by retrograde cavity preparation and mineral trioxide aggregate (MTA) retrofilling with 12, RCT with 11 and 13, and extraction of 22 during the surgical procedure along with cyst enucleation. RCT with 11, 12, and 13 was completed. Consent for surgery obtained. Under 2% local anesthetic with adrenaline (1:200,000) (Neon, Andheri East, Mumbai), a full-thickness mucoperiosteal rectangular flap was elevated from distal of 13-23 [Figure 2]a. A bony defect was seen with 22 [Figure 2]b. Extraction of 22 followed by cyst enucleation was carried out. 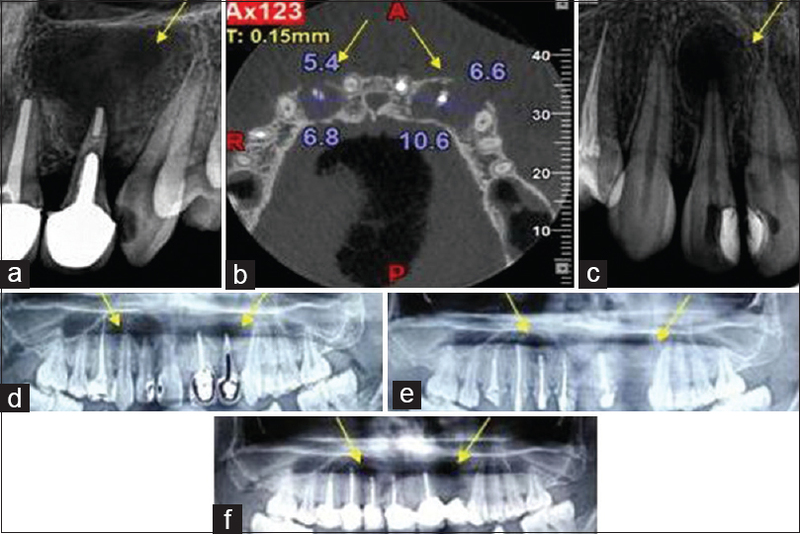 The apex of the tooth was located by calculating approximate length on CBCT. Osteotomy was carried out near the apex of 12 and 13 [Figure 2]c and cyst enucleation and apicoectomy for 12 and 13 using microsurgical technique, with a zero-degree bevel was done using long-shank round carbide bur (Prima Dental Group, Stephenson Drive, Gloucester, UK) attached to slow speed handpiece with continuous saline irrigation. The area was inspected using micromirror placed into the osteotomy window at a 45° angle. Retrocavity preparation was carried out with 12 and 13 using diamond-coated ultrasonic tip AS 3D (Satellac, Acteon, Merignac, France) [Figure 2]d at power setting of 3, for creating 3 mm type 1 cavity using copious irrigation. MTA was manipulated as per manufacturer's instruction and placed in the retrocavity [Figure 2]e. Adequacy of the retrograde filling was checked by radiographs. Flap was repositioned and interrupted sutures were placed using nonresorbable 3-0 silk (Ethicon, Johnson and Johnson, India) [Figure 2]f. After postoperative instruction, the patient was recalled for checkup after 24 h and 7 days later for suture removal and a further follow-up after 1, 3, 6, 9, and 12 months. Histopathologic investigation for 12 and 22 showed varying thickness of epithelium with fibrocellular connective stroma [Figure 2]g. On higher magnification, the epithelium was disrupted with infiltration of chronic inflammatory cells along with vacuolations within the epithelium. Connective tissue showed dense infiltration of lymphocytes and foam cells with few macrophages [Figure 2]h, thus diagnosing the lesion as radicular cyst. The patient has been followed up for 3 and 6 months [Figure 1]e and [Figure 1]f.
Cyst is a pathological fluid-filled cavity lined by epithelium that results when rests of epithelial cells (Malassez) in the periodontal ligament are stimulated to proliferate and undergo cystic degeneration by inflammatory products from a nonvital tooth, found in the anterior maxilla than other parts of oral cavity, as in the present case. Radicular cysts are usually asymptomatic and are unnoticed, until detected by routine radiographic examination, as in the present case, the patient visited for restoration of a carious tooth and it was noticed on routine clinical and radiographic examination. Associated teeth are always nonvital and may show discoloration. In the present case, 11 and 12 had tooth-colored restorations which appeared faulty and could have led to microleakage leading to pulpal and periapical disease. In this case, CBCT showed that there was discontinuity of labial cortical plate with 22 suggestive of perforation. Radiographically, most radicular cyst appears as round- or pear-shaped radiolucent lesion. During the surgical procedure, since the cystic lining involved the apex of 13, a decision to carry out retrocavity and retrograde filling with MTA was taken. There was healthy bone in relation to 11 and 21, and hence, no surgical intervention carried out with these two teeth. Microsurgery includes production of a small osteotomy of 5 mm, which is big enough to allow adequate access for all microinstruments to visualize the root end. Resection of the apical 3 mm at root end perpendicular to the long axis of the root, with zero-degree bevel as compared to the conventional method of beveling at an angle of 45°, more bone needs to be removed. 3 mm removal of root apex helps decrease complex anatomies such as lateral canals and apical ramifications that exist at apical third. In the present case, MTA was used as retrograde filling material with 12 and 13, as it shows excellent biocompatibility, ideal adherence to the cavity walls, and low solubility. The biologic properties of MTA in human periapical tissues are attributed to the production of bone morphogenetic protein-2 and transforming growth factor beta-1. New cementum may be derived from either the remaining periodontal ligament or it is derived from the ingrowing connective tissue. Ultrasonics, used to prepare the retrocavity, leads to cleaner and deeper cavity centered in the root canal with a reduced bevel angle is achieved. Ultrasonic cutting seems to be influenced by the power setting, as larger fragments of dentin are removed at higher power. Low power setting and continuous irrigation will prevent damage to the periodontium. Success rates approaching 90% or above has been documented for apical surgery. A radicular cyst associated with a root apex sometimes goes unnoticed. This case illustrates the successful management of a radicular cyst with enucleation and endodontic treatment. It is suggested that the treatment of the radicular cysts should be defined according to the clinical and radiographic evaluations for each case. Jones AV, Craig GT, Franklin CD. Range and demographics of odontogenic cysts diagnosed in a UK population over a 30-year period. J Oral Pathol Med 2006;35:500-7. Krishnamurthy V, Haridas S, Garud M, Vahanwala S, Nayak CD, Pagare SS, et al. Radicular cyst masquerading as a multilocular radiolucency. Quintessence Int 2013;44:71-3. Rajendran R, Sivapathasundharam B. Shafer's Textbook of Oral Pathology. Delhi: Elsevier/Reed Elsevier; 2009. p 487-90. Pekiner FZ, Borahan O, Ugurlu F, Horasan S, Sener BC, Olgac V. Clinical and radiological features of a large radicular cyst involving the entire maxillary sinus. Journal of Marmara University Institute of Health Sciences 2012;2:31-6. Shear M. Cysts of the Oral Regions. 3rd ed. Boston: Wright; 1992. p. 136-70. Cawson RA, Odell EW, Porter S. Cawson's Essentials of Oral Pathology and oral Medicine. 7th edition. Porter: Churchill Livingstone; 2002. p 102-21. Kim E, Song JS, Jung IY, Lee SJ, Kim S. Prospective clinical study evaluating endodontic microsurgery outcomes for cases with lesions of endodontic origin compared with cases with lesions of combined periodontal-endodontic origin. J Endod 2008;34:546-51. Camilleri J, Pitt Ford TR. Mineral trioxide aggregate: A review of the constituents and biological properties of the material. Int Endod J 2006;39:747-54. Torabinejad M, Pitt Ford TR, McKendry DJ, Abedi HR, Miller DA, Kariyawasam SP, et al. Histologic assessment of mineral trioxide aggregate as a root-end filling in monkeys 1997. Int Endod J 2009;42:408-11. Rosales-Leal JI, Olmedo-Gaya V, Vallecillo-Capilla M, Luna-del Castillo JD. Influence of cavity preparation technique (rotary vs. Ultrasonic) on microleakage and marginal fit of six end-root filling materials. Med Oral Patol Oral Cir Bucal 2011;16:e185-9. Paz E, Satovsky J, Moldauer I. Comparison of the cutting efficiency of two ultrasonic units utilizing two different tips at two different power settings. J Endod 2005;31:824-6.
von Arx T. Apical surgery: A review of current techniques and outcome. Saudi Dent J 2011;23:9-15.